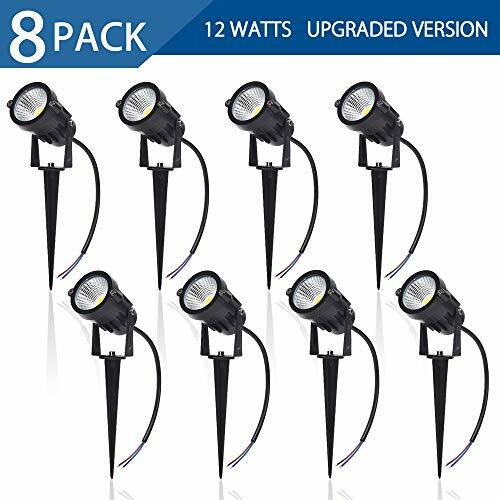 This quickfit 12W led landscape garden lights set AC/DC 12V safe outdoor work voltage,super warm white(900lm) led lights best choice for illuminating your garden pathway,outdoor step,driveways &flower beds . Thick casting aluminum body and glass len design ensure long lifespan around 50,000 hours .Mini sized and easy installation with spike stands --just put in ground. - Ideal for outdoor use ,such as Lawn ,Garden ,Yard ,Driveway ,Pathway and landscape etc. Please supply the lamp with proper input voltage that is AC/DC 12V to ensure reliable operation. SAFE LOW VOLTAGE OUTDOOR USE:AC/DC 12V working voltage compatible with most low voltage landscape lighting systems,extra low voltage transformer Required for installation (NOT INCLUDED in this set). TRIPLE WATER RESISTANT : thick aluminum body and glass lens cover design withstand rainy and snowy weather; IP65 waterproof design which greatly improves the stability of outdoor lighting and long-term use. If you have any questions about this product by SUNVIE, contact us by completing and submitting the form below. If you are looking for a specif part number, please include it with your message.